Piketberg is a lovely little town nestling at the bottom of the Piket mountain range which soars 1430 metres above the town. 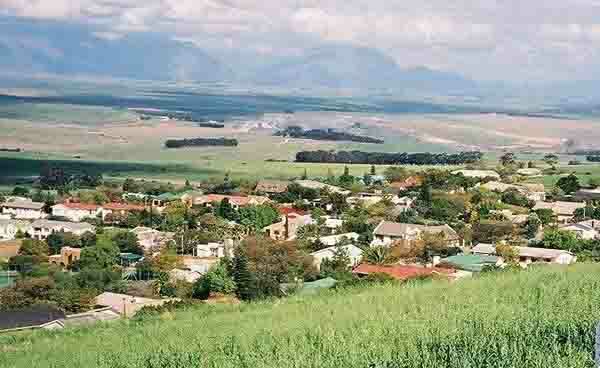 Piketberg was established in 1836 when Sir Benjamin D'Urban gave the ruling farm in the area to the Church council. This allowed the church to govern the town which grew up around it until 1901. 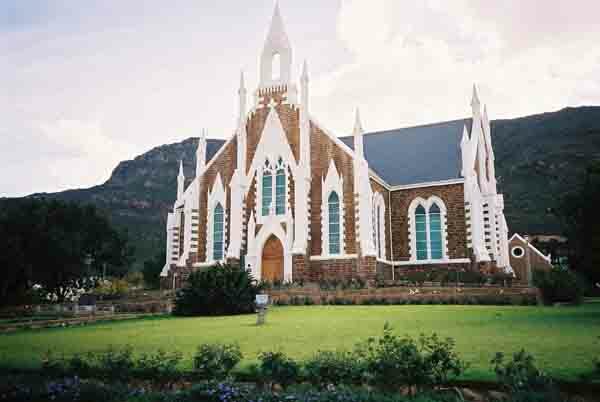 In every country town in SA you are likely to find a Dutch Reformed Church. It's normally the largest building in the town and always has a church steeple. In Piketberg this tradition is no exception. They have a large church which was designed by Carl Otto Hager between 1880 and 1882. It has some very interesting towers, window patterns and plastered panels. These designs are repeated inside the church on the pulpit. Nearby is the Jewish Synagogue which was built in 1925. It is used as a Museum today and features antique furniture and a switchboard that comes out of the ark. Some of the antique furniture was made of Orange wood, which I had never seen before. When I enquired about it I was told that there was not much wood in the area at the time so the people used what they had. This wood came from the orange orchards of the town. The Piketberg High School also has an interesting exhibit in the form of a cannon which was once sited on top of the mountain range. It was used to alert farmers in the area of raids by the “Gonjemans” who attacked the farms. The Gonjemans were the Koisan people who lived in the area. It also served to advise farmers that visiting ships had arrived in Table Bay and that there was a market for their crops. The view from the town is quite spectacular as it looks out over a valley of rolling wheatfields. In the distance one can see the Cedarberg mountain range towards the north east. 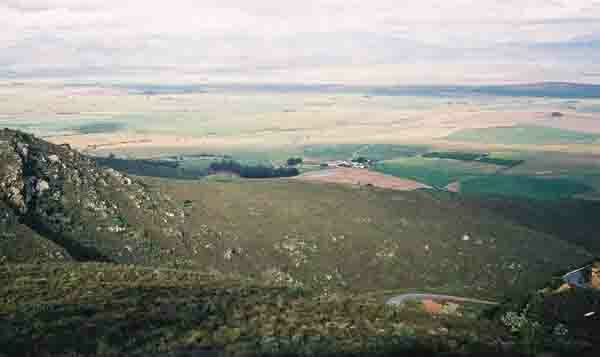 Eastwards directly across the valley is the Oliphants River range and behind them the Kouebokkeveld Mountin range and Behind i tis the Skurweberg range with its highest peak at 2071 metres. Most of these peaks are snow capped at times during the winter months. About 3 kilometres to the north of the town is the very scenic Versveld Pass which takes you up to the top of the plateau to a place known as Piket-Bo-Berg The views from this winding road which was first built in 1899 are quite spectacular. Once at the top of the pass you drive into a farming area where there are orange, pear, peach and apple orchards. No one would expect to find farms at the top as the vegetation on the way up is Fynbos and the peaks look rather rocky.Of course the apple trees love the weather conditions, cold in winter and warmer in summer. At the time of writing this article it was spring in the Cape and the fynbos and wild flowers were out in force. Many shades of yellow and purple. (these seem to be the dominant colours) A really beautiful sight were the orange trees which still had oranges hanging on them but were also blooming. 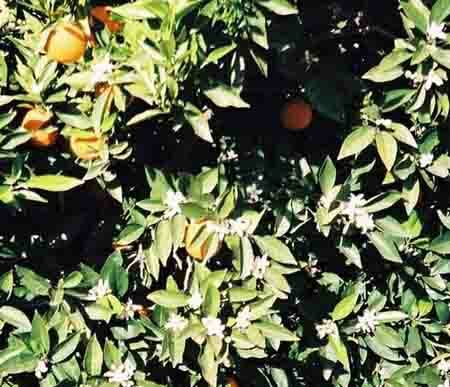 The dark green leaves of the trees, the white blooms and the oranges really made for a pretty picture. On top of the Piket range of mountains we had a beautiful view to the west where one could see the Atlantic Ocean in the distance and the beautiful patchwork of different coloured wheatfields of the region. For the visitor there is plenty to see and do. For those who love the peace and tranquility of out of the way places and country fare Piketberg and its surrounding towns are the places to visit.